Thanksgiving traditions vary among families, but the tie that binds us is the indulgent, gastronomic feast set on dinner tables across America on this holiday. We collectively pull up our chairs to gobble up pounds of savory food, and then unfasten the button of our pants to make room for sweet pumpkin pie. 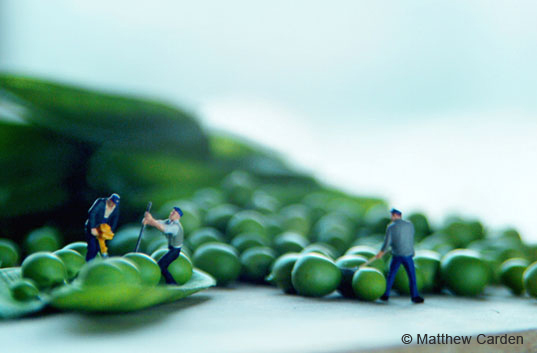 Photographer Matthew Carden's "Small World" photographs are a poignant, artistic reminder to cherish every tiny morsel of food this Thanksgiving. Finding bounty in each bite will help preserve the planet and foster a healthy, mindful approach to consumption. According to the National Turkey Federation, the turkey industry earned $13.9 billion in 2007. 235 million of the 271 million turkeys raised in 2007 were consumed by Americans, mostly on Thanksgiving. Clearly, food production is an enormous enterprise; which means as eco-conscious advocates, we must be aware of our relationship with food, how we purchase it, consume it, and dispose of it. Thanksgiving is an opportune time to teach our children good, earth loving habits such as buying organic, locally grown foods, preparing and eating food mindfully, and composting or recycling food waste and byproducts, or perhaps going the vegan or vegetarian route. With these roots, our children will grow-up with healthy traditions, which will be instilled in future generations. On a global scale, Slow Food (as opposed to ‘fast food’), is an organization which seeks to educate people with regard to their relationship to food. They “believe that the food we eat should taste good; that it should be produced in a clean way that does not harm the environment, animal welfare or our health; and that food producers should receive fair compensation for their work.” Slow Food also seeks to enrich the lives of children and foster their healthy relationship with food, through their Taste Education missions, which include planting gardens in schools from whence school lunches are made. After feasting your eyes on Matthew Carden’s fun, insightful photographs, enjoy your Thanksgiving celebrations, and remember to serve up plenty of food for thought this holiday. I truly thought these were the photographs of Audrey Heller. These are EXACTLY like hers. Audrey Heller isn't the first nor the best at it... http://little-people.blogspot.com/ A LOT of artists have been turning to this artform. it's an interesting one and the take on food is a nice twist really... PS.. the 'security code' feature is truly illegible!!! i would like to know where can i buy this kind of figures to do my own photos...!!! It is incredible!! There are so many people who take this kind of fotos...i thought there was just Willy Rojas ( I have to pictures of him in my room) and litlle-people. Hey Carlos, these little figures are available in various scales from any model train store. I used them for a photo set at a 'car party' we hosted for my son and his car crazy fiends. Audrey Heller has been doing these since 1996. 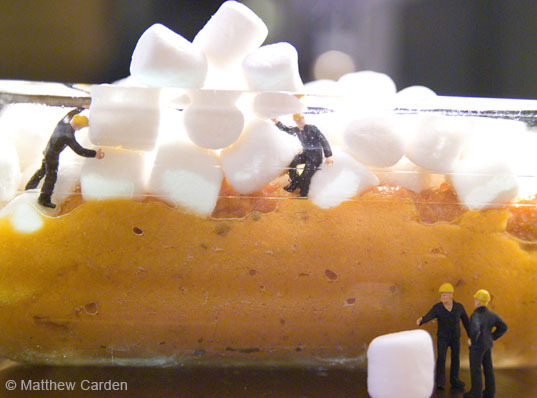 Slinkachu (above referenced by None) would have been 12 at the time. Willy Rojas was doing brilliant work in 1996, but had not begun this type of scale play. There is also a difference between being inspired by an idea and essentially copying the idea, and that difference is obvious here. Matthew Carden also happens to live in the same city as Audrey. 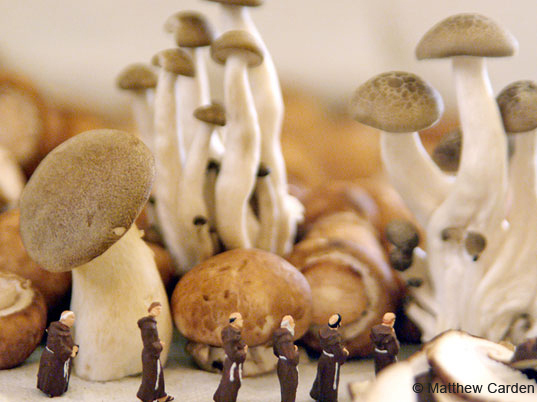 Slinkachu is in London and Willy Rojas is in Barcelona. .........loving the hub-bub! Matthew Carden's work is available at fawn&forest http://www.fawnandforest.com/designers/191/products .............skiing on sprinkles! Hey people- Just because a few artists are working with similar devices, in a similar style, does not necessarily mean that any of them are copying each other. Good ideas are easy to come by, and it is very common that different artists in different parts of the world come up with similar ideas independently. This happens all the time in the art world and in the design space, but to imply that there is some sort of plagiarism going on is taking things too far, I believe. 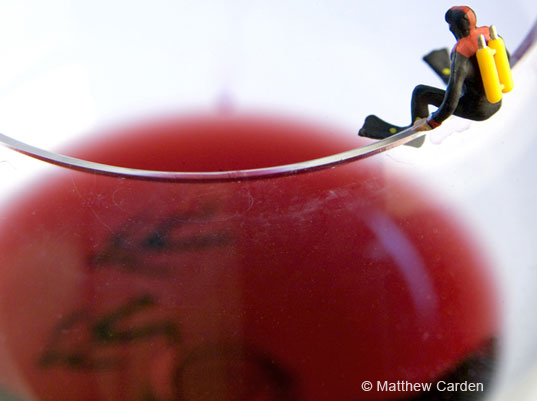 Matthew's photography captured my imagination, and I thought it was the perfect vehicle for the topic I wanted to write about: food consumption and appreciation in light of the Thanksgiving holiday. Art that makes you think and opens your mind is a gift, and there is plenty of room for interpretation and artists to express themselves on many levels, even similar levels. I second what Matthew said: I see a world some day where all the little people out there can get along�. Matthew Carden's pictorial elicits an understanding of the paradox that food is both a whimsical pleasure and a precious, vital gift. 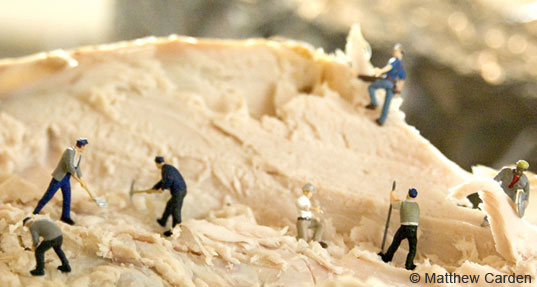 Thanksgiving is the ideal backdrop for a glimpse into his "Small World," where food is both celebrated and appreciated. Carden's aim is to "make viewers more aware of what they eat, and to simply think about food as an integral part of our world." 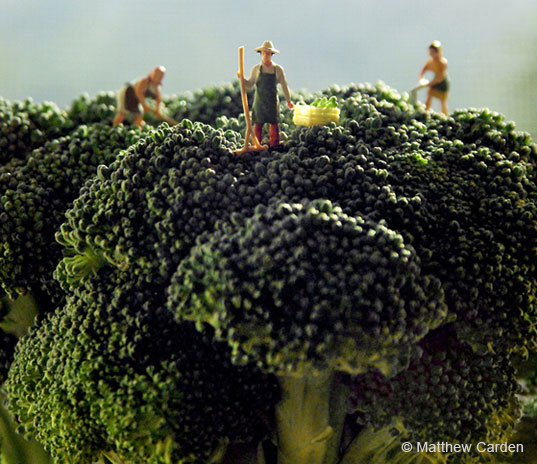 Via the juxtaposition of tiny figures amidst "seemingly colossal" food, his photographs, "speak of abundance and the ultimate waste produced on a daily basis in our land of plenty." On a global scale, Slow Food (as opposed to 'fast food'), is an organization which seeks to educate people with regard to their relationship to food. They "believe that the food we eat should taste good; that it should be produced in a clean way that does not harm the environment, animal welfare or our health; and that food producers should receive fair compensation for their work." Slow Food also seeks to enrich the lives of children and foster their healthy relationship with food, through their Taste Education missions, which include planting gardens in schools from whence school lunches are made. After feasting your eyes on Matthew Carden's fun, insightful photographs, enjoy your Thanksgiving celebrations, and remember to serve up plenty of food for thought this holiday.